This week in Ms. Alba’s Class, AP Seminar Scholars will prepare to deliver Individual Multimedia Presentation and complete last draft of Individual Written Argument by ANALYSING video of the presentation and interviewing peers for IMP Oral Defense Questions. This week in Ms. Alba’s Class, Mexican American Literature Scholars will analyze literary form, social function, and political purpose of CORRIDOS as counternarratives. This week in Ms. Alba’s Class, English 3P Honors will study features of MODERNISM through Harlem Renaissance Inquiry Projects and Ch. 1-3 of The Great Gatsby by F. Scott Fitzgerald. Wednesday: Progress Check 6.1 a.) Who is F. Scott’s Fitzgerald? What is the context of The Great Gatsby? b.) Who is the narrator of The Great Gatsby? What characteristics reveal him to be an ARCHETYPAL UNRELIABLE NARRATOR? c.) How does Fitzgerald build a DISILLUSIONED TONE through the characters and settings in Chapters 1-3? Friday: Harlem Renaissance Inquiry Projects DUE report on findings in PANELS. This week AP Seminar Scholars will use PEER REVIEW PROCESS to revise Performance Task 2: IWA and will practice IMPs by completing a FlipGrid Video and performing a TECH Rehearsal with peers. This week English 3P Honors Scholars will develop Inquiry Focus for a curation project on the Harlem Renaissance and use e-link to build a digital literature review. H.W. Read & Complete Chapter Summary for The Great Gatsby Chapter 1-3 by Monday: Describe Nick Carraway and identify the features that make him an example of archetypal unreliable narrator. This week AP Seminar Scholars will begin to prepare for Performance Task 2 by evaluating AP Research Practice Presentations and writing the IWA Conclusion and Call to Action. H.W. IWA (Rubric) Typed Draft #1 Due See Google Classroom for Instructions! This week English 3P Honors scholars will learn the definition and historical context of American Modernism, by analyzing poetry and participating in a GALLERY WALK. This week AP SEMINAR SCHOLARS will write the paragraphs that INTRODUCE your ARGUMENT and LENSES through which you will be investigating the problem you are addressing. H.W. OVER THE BREAK WORK ON SOLUTIONS PARAGRAPHS (See Google Classroom for Writing Guide). This week Mexican American Literature and Culture Scholars will complete IDENTITY CHAPTER of their class portfolio. H.W. 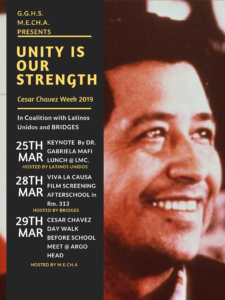 Attend one of the CESAR CHAVEZ WEEK EVENTS! Take a photo that represents where you come from or what makes you, you. This can be at school, your home, or in your community. Think creatively and remember to be intentional throughout the process. Due WEDNESDAY in Google Class! TUESDAY: Choose an ANALYTICAL SUMMARY or RESPONSE from your NOTEBOOK and add that to your Portfolio. This week AP Seminar Scholars will write an annotated bibliography that includes a minimum of TWO AP Seminar Stimulus TEXTS and FOUR JOURNALISTIC SOURCES to formulate focus on TOPIC and develop a well-designed RESEARCH QUESTION. TUESDAY: 1. IRR Final Read Around Part II 2. Problem Definition: Performance Task 2 Problem Definition Template and Q.U.E.S.T.ion development. A.) Focus—Specific variable/component of the phenomena (What SPECIFIC problem?) to be explored or measured? E.) Language and Style: Grammatically Correct, Clearly Written, and Easy to understand? This week Mexican American Lit Scholars will write Ekphrastic Poems inspired by David Botello’s murals and Magnetic Poems inspired by Frank Mundo’s narrative. H.W. Read & Write Chapter Summary Ch. XXII-XXIII of The Awakening by Kate Chopin by Friday, March 22. This week in Ms. Alba’s Class we will finish Team Multimedia Presentation and use critical feedback to ensure that we meet College Board Rubric Requirements. This week in Mexican American Literature, we will use views of identity in Frank Mundo’s “How I Became a Mexican” from the Ban This! Anthology, Rosario Castellano’s “Silence Concerning an Ancient Stone,” and David Botello’s Murals. Tuesday: “Inocente” Film Screening: How does Inocente use art and creativity to build her sense of IDENTITY? This week in English 3P Honors, we will analyze REALIST features in Jack London’s “To Build a Fire” and Ch. 1-10 of Kate Chopin’s The Awakening, and Mark Twain’s “The Lowest Animal”. This week in Ms. Alba’s Class we will develop our Team Multimedia Presentation and receive critical feedback to ensure that we meet College Board Rubric Requirements. This week in Mexican American Literature, we will analyze views of identity in Frank Mundo’s “How I Became a Mexican” from the Ban This! Anthology, Rosario Castellano’s “Silence Concerning an Ancient Stone,” and David Botello’s Murals. This week in English 3P Honors, we will learn the features of Realist art and literature and analyze those features in Jack London’s “To Build a Fire” and Ch. 1-10 of Kate Chopin’s The Awakening. After completing ANNOTATED BIBLIOGRAPHIES with 8-10 sources, AP Seminar Scholars will contextualize the problem and disciplinary lens in a clearly written INTRODUCTION. Friday: 1.) Notebooks Self-Assesment 2.) What best represents your learning? This week we will talk back to CIVIL WAR ERA political thinkers by presenting a team speech and preparing for a poem recitation. This week, AP Seminar will use EBSCOHost Databases to UNDERSTAND and ANALYZE INDIVIDUAL LENS and complete an ANNOTATED BIBLIOGRAPHY to prepare for TIMED WRITE of IRR INTRODUCTION on February 19th. Friday: Team Meet Up and QUESTION the initial Research Purpose and QUESTion. This week, English 3P Honors will show understanding of Collection 4’s views by reciting Dialogue Poems, analyzing Robert Hayden’s “Runagate Runagate,” and writing Ekphrastic Poems using Civil War Photography. This week we will QUESTION and EXPLORE previous learning about effective teams and UNDERSTAND and ANALYZE interests to identify a TOPIC for performance task 1 Team Multimedia Presentation. Monday: 1. Notebook Reflection on Project Expectations: a. What will be your GOALS for the TMP? b. What was the INDIVIDUAL learning you picked up from the last project? What are your personal struggles? What are your personal strengths? What changes will you make based on your learning? 2. Watch TED Talk titled “Teamwork Reimagined” delivered by Kevin Cahill to identify what makes effective teams? Wednesday: 1. TOP CHEF Presentation: TOPIC, PURPOSE, and REASONS it is important. This week we will discuss the role of stories to our sense of identity and its impact to our sense of belonging. Tuesday: 1. Family Search 2.) Finish “The Dangers of a Single Story” 2. Write a Collaborative Analytical Summary that identifies the argument presented by Chimamanda Adichie. Friday: 1. Half Like Me: Part I. 2. Where does your story begin? This week we will compare views of FREEDOM communicated by speeches by Abraham Lincoln and Frederick Douglass by writing comparative summaries, writing dialogue poems, and discussing the relevance of their ideas to contemporary American culture and society. Monday: 1. The New Birth of Freedom: Notes 2.) Close Read “Second Inaugural Address” by Abraham Lincoln and complete TPCCC Analysis that also evaluates the use of RHETORICAL TRIANGLE. Tuesday: 1. Complete TPCCC Analysis 2. Frederick Douglass Background 3. Read What to the Slave is the Fourth of July by Frederick Douglass: complete TPCCC Analysis that also evaluates the use of RHETORICAL TRIANGLE. Thursday: Write a Dialogue Poems using Lincoln & Douglass Speeches.